2015 Porsche 911 GT3 RS the name to us upon hearing first time, sounded like a blend, we decided to study and excavate; 911 GT3 released by Porsche in the year 1999 is a successor of the model released by company in the year 1973, Porsche 911 RS. But the hammer still kept on banging as to what all it will bring beneath its hood and the comfort and features it’ll offer. So with this we decided to bring this Porsche 911 GT3 RS 2015 review and specification details. Let’s have a look. The interior of Porsche 911 GT3 Rs 2015 to a lot of extent mirrors the one in present GT3; this in turn implies excessive use of Alcantara and a sober sporty texture. However looking closely we inspected a couple of newborn features like full bucket seats. We also tried to compare the GT3 RS with 918 Spyder and found the roots of carbon fiber inserts, lighter door handles and an impeccable motorsport steering wheel. Apart from the Club sport package for those who are looking for more race spec techs hold the option of rolling to Sport Chrono package featuring in built timers and Porsche Track Precision application, to manage the track data and to allow the driver to share and compare the same with other drivers. 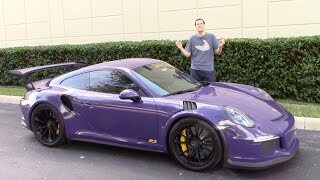 Exterior of Porsche 911 GT3 RS 2015 might look same to a new guy in town but a close analysis will drag to your notice its newly designed bumper, thinner LED strips and a large splitter followed by little different hood, headlights and front fenders. At the rear you’ll notice a significant change made by Porsche in its rear fenders, sporting Turbo like intakes. In all the exterior design is catchy with few new redesigns while few with minute changes and yes before leaving accolades for lighter body and offering commendable balance and control at high speeds. Talking about competitors for Porsche 911 GT3 RS 2015, Chevrolet Corvette Z06 and Ferrari 458 speciale might meet the model at battle field.